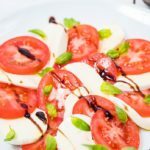 This Caprese Salad or the Insalata Caprese is a classic Italian dish that is loaded with juicy, perfectly ripe tomatoes, fresh mozzarella, fragrant basil. It’s topped with olive oil and a delicious balsamic glaze. The balsamic glaze brings together all the favors for an incredible Italian inspired meal, appetizer or snack. It is super easy to whip up, vibrant, yet incredibly tasty and naturally low carb. 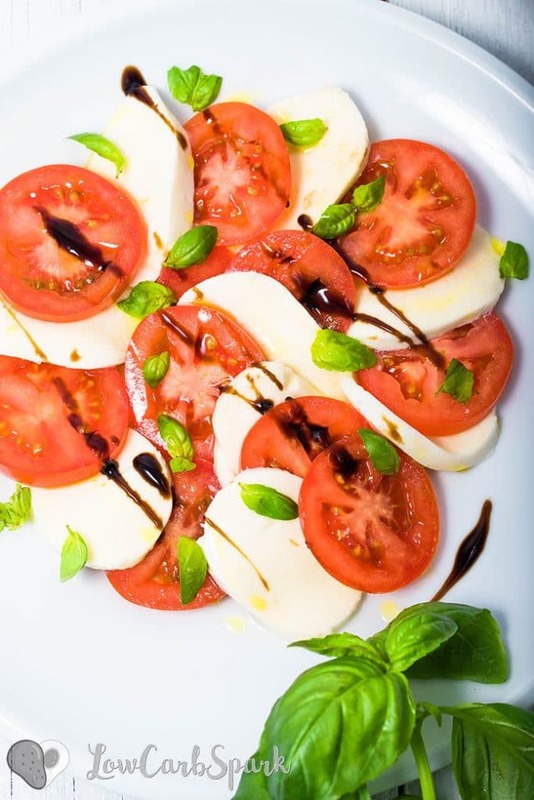 Caprese salad is the perfect recipe for a hot summer day; it’s refreshing, tasty and light. During summertime salads are my to-go lunches since they are easy to make, delicious and they keep me hydrated and energized. 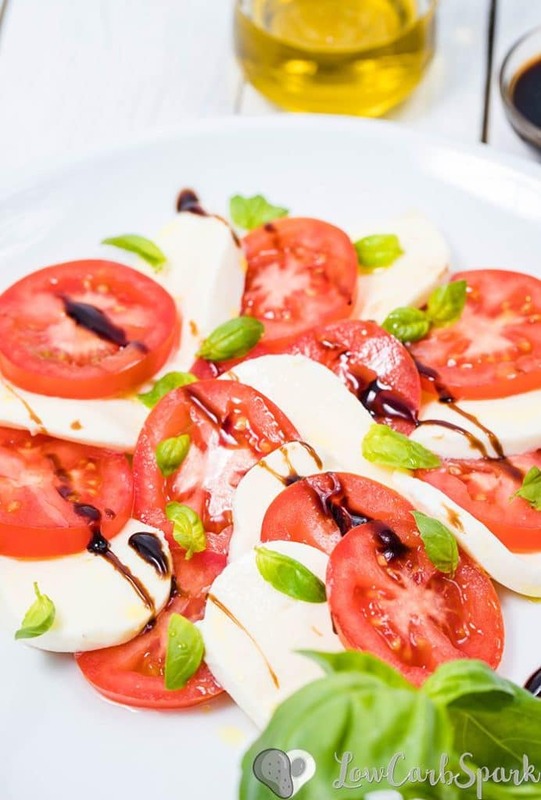 Ever since I visited Italy a few years ago, my absolute favorite summer dish is the Caprese Salad. 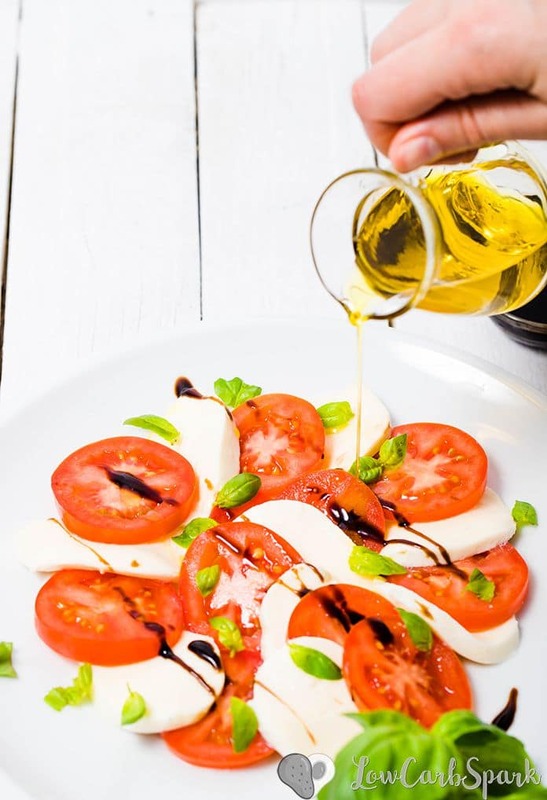 The combo of tomatoes, mozzarella, fresh basil, and balsamic glaze it’s incredibly mouthwatering. And it looks outstanding too. The colors are so beautiful and vibrant. Why do I love to make Caprese Salad in the summer? Well, that’s because any tomato tastes excellent. I like to use larger varieties of tomatoes, Roma, cherry or grape tomatoes. 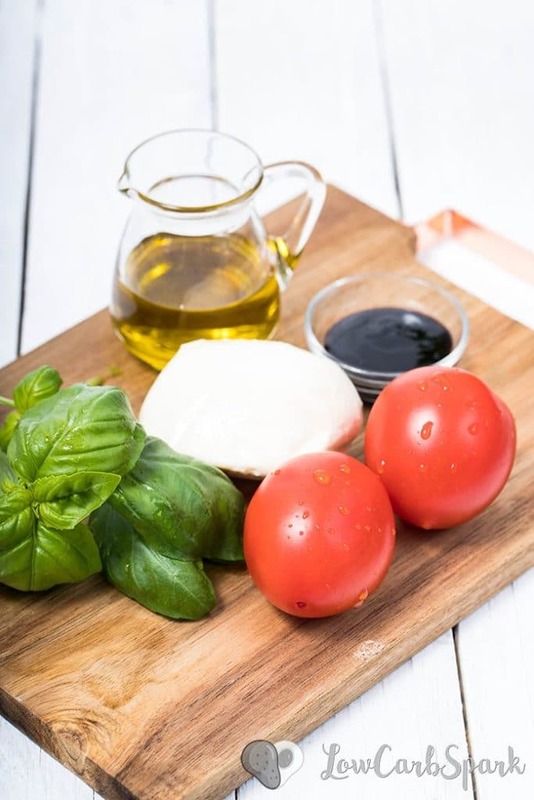 What ingredients to use for Caprese Salad? To make the best tasting Caprese salad, use the freshest ingredients you can find. I love to drizzle thick balsamic glaze for an extra tangy and sweet taste in every bite. To make my favorite balsamic glaze, you need only one ingredient: balsamic vinegar. For some extra sweetness, you can add molasses, honey or brown sugar while cooking (keep out for keto). Chose top quality ingredients because it cooks faster and tastes better than the cheaper balsamic vinegar. Add 2 cups balsamic vinegar to a medium pot or saucepan and place over medium heat. Bring to boil then reduce heat and let it simmer for about 20 minutes or until it starts to thicken. You’ll know it done when it’s thick enough to coat the back of a spoon. Each serving (1 tsp) has about 2g carbs, so that’s the perfect low carb dressing for the Caprese salad. Give this salad a try at your next meal or surprise your guests. Let me know what you think in the comments below. Alternate the slices of tomatoes and mozzarella on a large plate. Sprinkle chopped pieces of fresh basil on top. Drizzle olive oil and balsamic glaze and serve immediately.